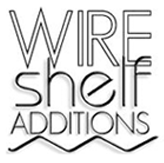 "For All Your Wire Rack Shelving Needs"
Increase efficiency and versatility of your storage unit. © 2014 Wire Shelf Additions. All Rights Reserved.